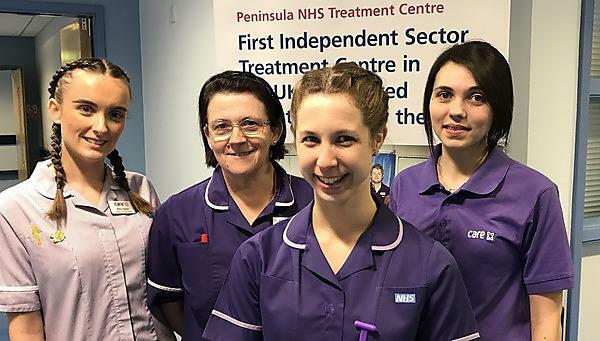 Peninsula NHS Treatment Centre in Plymouth has promoted recent graduate Lucy Maker to the role of ward manager. Peninsula NHS Treatment Centre in Plymouth has promoted nursing alumna Lucy Maker to the role of ward manager. Encouraged by this early taste of nursing, Lucy worked as a health care assistant during her A-levels, after which she studied nursing at the University of Plymouth. Lucy graduated in 2012 and joined the orthopaedics team at Derriford Hospital – where her nursing experience began. She stayed with this team for a year and a half and learned about caring for major trauma patients, before developing her wound care skills on a plastics, ENT and maxilla-facial ward. Lucy was a team leader for 11 months, when she was promoted to the role of deputy ward manager – “my ambition of reaching a sister grade by 25 had been achieved!” Lucy has performed this role for a year, gaining in confidence and experience. Her colleagues have been impressed by her abilities in this role, which has prepared her for her new job as ward manager. Peninsula NHS Treatment Centre offers a range of care options including orthopaedic, cataract and general surgery and endoscopic investigations. If your GP agrees that you need treatment you can ask them to refer you to the hospital for treatment – it is part of your choice as an NHS patient. It is the first hospital of its kind to have been awarded an overall ‘Outstanding’ rating by the Care Quality Commission. For more information about current vacancies at Peninsula NHS Treatment Centre please visit http://www.peninsulatreatmentcentre.nhs.uk/information-for-professionals/jobs/. Our nursing students gain real world experience with 50 per cent of their course spent on placement. You will participate in the best and most varied hands-on experience within a host locality. In addition to this, you’ll practice your clinical and communication skills in the safe, supervised setting of our Clinical Skills Resource Centre (CSRC) which features specially designed replicas of hospital wards and emergency rooms, with patient-simulators.